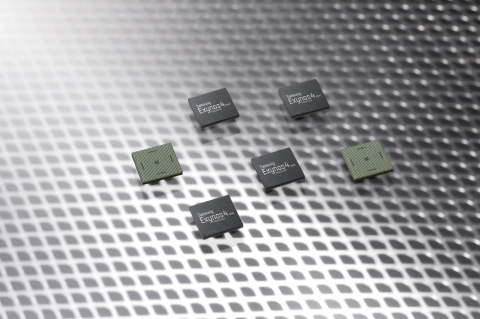 SEOUL--(Korea Newswire) April 26, 2012 -- Samsung Electronics Co. Ltd., a world leader in advanced semiconductor solutions, today introduced the industry’s first quad-core application processor built on the High-k Metal Gate (HKMG) low-power process technology. With unprecedented performance capabilities exceeding 1.4GHz based on the ARM® CORTEXTM A9 quad-core, the powerful, yet energy-efficient Exynos 4 Quad, allows system-level architects to integrate maximized power efficiencies into smartphones and tablets which enables double the processing power at a 20 percent lower power bill over its predecessor, the 45nm process-based Exynos 4 Dual. Benefitting from a use case where the parallel processing and workload sharing among the four cores is necessary, the Exynos 4 Quad is particular well suited for heavy-load applications such as 3D games, video editing, and calculation-intensive simulation. Due to its 32nm HKMG low-power process and power-saving design, the Exynos 4 Quad has two-times the processing capability over the 45nm process based Exynos 4 Dual while consuming 20-percent less power. To improve power efficiency, Samsung adopted hot-plug functionality to support on-off switching for each core as well as the per-core dynamic voltage and frequency scaling (DVFS), which offers a dramatic reduction in power consumption by adapting different levels of voltage and frequency when changing workloads. “The application processor is a crucial element in providing our customers with PC-like experience on mobile devices. Samsung’s next Galaxy device, which will be officially announced soon, offers uncompromised performance and ground breaking multi-tasking features, thanks to Exynos 4 Quad’s powerful performance and efficient energy management technology,” said Hankil Yoon, Senior Vice President of Product Strategy Team, Samsung’s Mobile Communications Business.